PUBG (PlayerUnknown’s Battlegrounds) is a massive survival game that has gained immense popularity since it went to Early Access stages on March 23, 2017. Since it is Early Access stage at the time of this writing, the game is not optimized at all, so you might experience lag issues if you do not optimize the game as much as you can yourself. You might lag even after doing game optimizations on PUBG, but not as much as before the optimizations. You can utilize a high refresh rate monitor for this game, so if you have one, you might very interested in getting higher frame rates to get a smoother gaming experience and possibly give you a competitive edge. 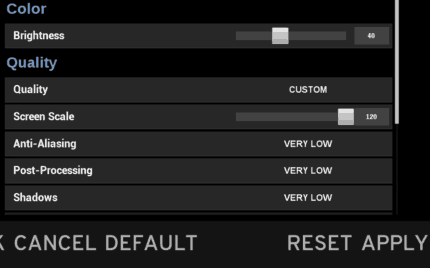 These are also the settings that a lot of pro players use. First and foremost, change your power settings to High Performance if you’re on a laptop. Also, make sure that you have your graphics card settings optimized in order to deliver more performance. 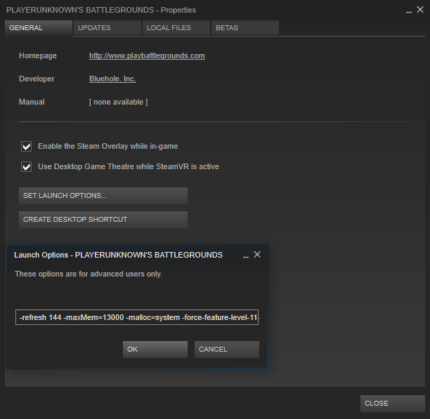 We’ll now make sure that the launch options are optimized for PUBG, we think you’ll find these especially useful since some of them can’t be configured in the game itself, so you have to modify the launch settings yourself. Add “-refresh 144 -maxMem=13000 -malloc=system -force-feature-level-11-0 -USEALLAVAILABLECORES -sm4” in there. “-sm4” will change shaders from DX11 to DX10 and will remove some distracting reflections from the game. “-USEALLAVAILABLECORES” should make the game utilize all your CPU cores, but it’s uncertain if it still helps as the game should be able to do this on its own now. Adjust the brightness to your preferred level. Find a good spot, so you are able to spot people in dark corners, etc. Set Anti-Aliasing to Very Low. You can change this to a higher setting if you can’t play with flickering edges. Set Post-Processing to Very Low. This will increase visibility since there will be no more saturation and bloom. Set Texture to anything you are comfortable with. 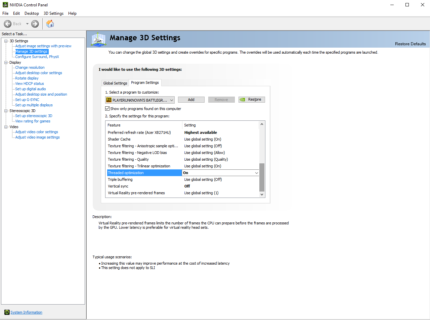 Compare your FPS while changing this setting, as you might get a higher FPS on a higher setting due to CPU overload in the game’s current state. Some professionals argue that it’s harder to see enemies in high-quality textures. Set Effects to Very Low. If you don’t want to sacrifice too much visibility, then this is one of the best settings to change for that purpose. Set Foliage to Very Low. This will remove a lot of bushes and grass. Set View Distance to Low. Having this setting on Low should cover a quarter of the map, which will be more than enough. Having it any higher will punish your FPS for no apparent gains. You can always change this setting if you’re on a sniper tower, if you want to of course. Make sure MotionBlur is unchecked. 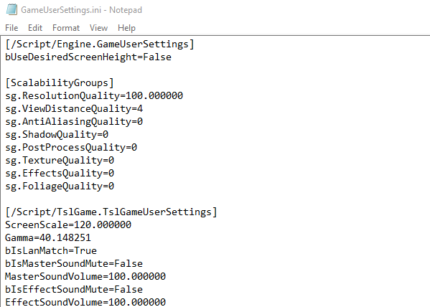 Reduce your Screen Scale to a number under 100 if you want higher FPS. If you have a good card, this setting should be at 100 to maintain good pixel quality. If you don’t want a very bad looking game, you can mess around with the Texture, Effects and Shadows setting as you like, but it will come at the cost of some performance if you change them to a higher setting. You can skip this part if you don’t want to lose any FPS. These settings will only improve the visibility a bit, ensuring that you get the clearest image possible. Only start this step AFTER you have saved your preferred in-game settings above. You can open this folder by searching on your Windows search field: %appdata%. Note that this will open the Roaming folder inside AppData, so you have to move up one level and then select the Local folder from there. Set ScreenScale=120.000000 in the correct line. You can skip this setting if you don’t want to lose FPS. This will help against no anti-aliasing drawbacks. Make the file “Read-only”. You can do this by right-clicking on the file and checking the “Read-only” check bar at the bottom of the window. That was it! We hope you enjoyed our PUBG Optimization Guide 2017! If you have any comments or suggestions, put them in the comments section below. Now go and get that chicken dinner!